Check that the shift lever is set in P.
Turn the engine switch to the “START” position to start the engine. Check that the shift lever is set in N.
Firmly depress the clutch pedal. Push in the key and turn it to the “LOCK” position. 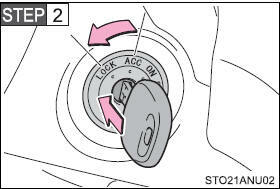 When starting the engine, the engine switch may seem stuck in the “LOCK” position. To free it, turn the key while turning the steering wheel slightly left and right. Always start the engine while sitting in the driver’s seat. Do not depress the accelerator pedal while starting the engine under any circumstances. Doing so may cause an accident resulting in death or serious injury. 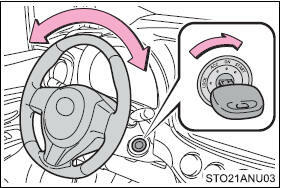 Do not turn the engine switch to the “LOCK” position while driving. If, in an emergency, you must turn the engine off while the vehicle is moving, turn the engine switch only to the “ACC” position to stop the engine. An accident may result if the engine is stopped while driving. 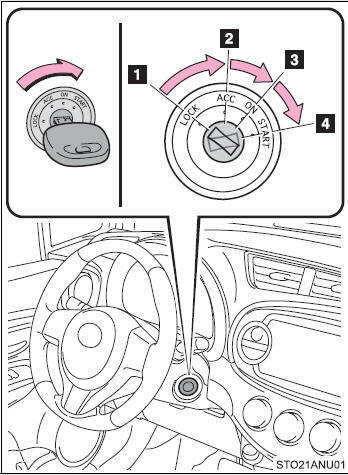 Do not leave the engine switch in the “ACC” or “ON” position for long periods of time without the engine running. ●Do not crank the engine for more than 30 seconds at a time. This may overheat the starter and wiring systems.